Patent Watch: Nintendo Gaming Phone Found! 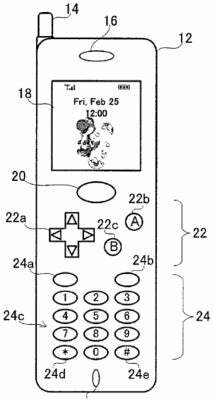 Forget Bejeweled or BrickBreaker, in 2001 Nintendo knew what was up with mobile gaming because they filed a patent for a gaming phone. Oddly enough, the patent was not issued until June 27, 2006, over four-and-a-half years later. I highly doubt Nintendo is planning on pursuing a phone like this, especially given that the patent is that old and their extreme success with all forms of the Gameboy and DS portable devices, but it is still neat to see unique gems like this one. Maybe Apple should team up with Nintendo to make the WiiPhone. I can already see the Nintendo and Apple fanboys coming together to form an ultimate fanboy capable of crushing everything Sony or Microsoft related.